For some reason I've been craving sugar lately ! Well, that should be enough of Scotty's opinion. Got notified today that we are to use entrance 3 adjacent to Vista Del Lago. THey would like us there by 8:00. Are we going to meet and go in as a group or just wander in individually? Who is planning this exercise? This is Karl's baby. He did a fine job last year. Meet at same place 7am? Along street Southwest corner on Palisades at Saguaro facing east. I think 7:30 is a nice round number to LEAVE Palisades to go across the street to the park. Anyone want to take an over-under on how many people are on time? Sorry I'll miss out this year. I have a daughter's birthday that weekend and won't make it to the show. Have fun! Agree on the 7:30 departure time. Last year I went in early (sometime just before 7:30) and it was already getting pretty busy at the entrance. Early is better. 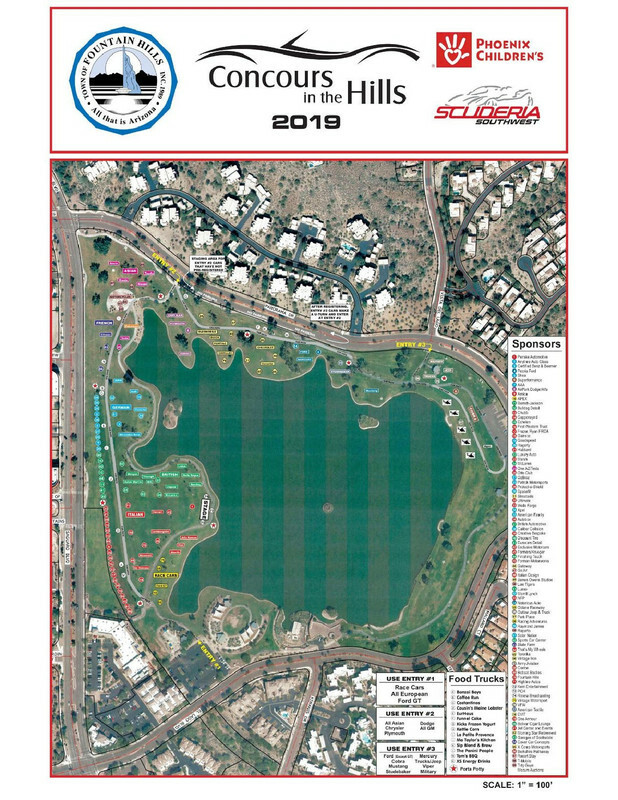 Karl and gang - A thought here.... Based on where they are having us enter the park at entrance three on the East side of the lake, across from Vista Del Lago, it might be a good idea for us to line up on Vista Del Lago pointed toward the lake rather than over on Palisades. That way, it will be a straight shot right across Panorama and into the park rather than having to cross Saguaro Drive and make our way all the way down Panorama to the east side of the lake where our entrance is. Looks to me like we must the biggest draw there so we are put out in the farthest east side of the show with the helicopters. Mike's fear has been realized. We are in the boonies, at the opposite part of the lake from the largest number of cars. We do have a parking lot right next to us. Might need an Uber to get to the west part action. Measures 1/2 mile on foot via the path around the lake. Still going. Wait until they hear us all rev our motors at 10am. Doubt that crossing Saguaro will be much of a problem. 7:30 is pretty early and last year there was a LEO directing traffic, which was stopped for our crossing. Don't know about the traffic control at Del Lago. Really doubt that it'll make a difference since many people will just come slipping in whenever they get around to it. Except for us it will be 11:00 am because we will be so far East we will be in the Central time zone. I may be directionally challenged but that looks like we're going to be on the far south side of the lake. Last edited by Danr55; 02-01-2019 at 03:15 AM..
You are right Dan, you are challenged. Same area as last year? Click on the photo and you can expand it to a larger size for ease of reading. Looks like that spot is as far away as you can get from any other cars and vendors and about a 1/2 mile hike to anything else in the Concourse as Bob B said. Hope you all bring your hiking boots. I certainly hope our location turns out to be better than it seems. Heck with it. I am gonna tape a big cardboard dorsal fin on the ole Kirkham and tell the guy at the entrance it’s a D-Type Jaguar so I can park up front with the blue bloods. I don’t think the guys at the entrance know the difference anyway (although the fact that my car has a working electrical system might give me away). If they get suspicious I will tell them it’s a special one-off racing version built for Sir something or other and once owned by Mick Jagger or something.